The manufacturer of the Russian Armata tank invited a delegation from Egypt to a military equipment and arms expo in Russia, where the capability of the new tank will be demonstrated. Uralvagonzavod, the main producer of Russian armored vehicles, plans to demonstrate its latest T-14 Armata tank to potential foreign customers, the company's director Oleg Sienko told TV Channel Russia-24. The new tank will be shown to delegates from Egypt during RAE 2015, the military equipment and arms expo in the city of Nizhny Tagil in the Urals Federal District, in September. "We invited the Egyptian delegation to the exhibition of weapons, which will be held in September this year, to show what this machine [the T-14 Armata tank] is capable of," Sienko said. The Armata platform, on which the new T-14 tank is constructed, has huge potential for future modernization. At this day and age, the Armata is by far the most advanced tank platform in the world, Sienko added. Furthermore, the new Russian tank is relatively cheap to manufacture in comparison with armored vehicles from other countries. This will make the Armata tank a coveted prize for many foreign arms buyers. 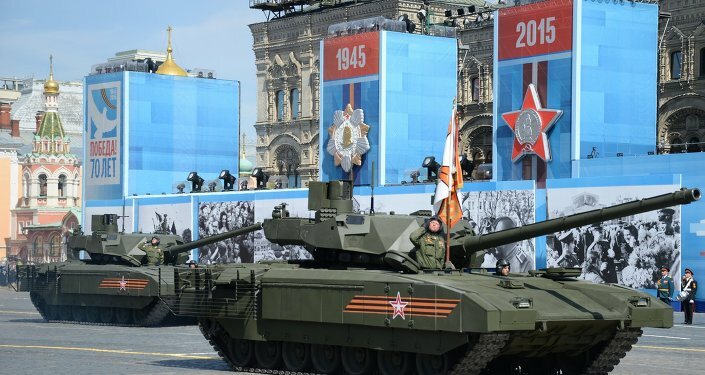 The Russian Defense Ministry showed its new tank during the Victory Day military parade in Moscow on May 9. The tank is operated by a crew of three, sitting in an armored capsule at the front. The tank's main armament includes a 7.62 mm remote-control machine gun and a 125-mm smoothbore cannon.